Well guys, it’s still crazy here at the newlywed house. We’re pretty much finished with the entire upstairs (main floor) level of the house (for now) and we are tired. In fact, other than some small projects, we’ve decided not to do any more work until after the holidays. Well, we think we deserve a break. And because I want to decorate our house for the holidays…without all the distractions and clutter and mess that comes with remodeling. And also because we want to live in our home for awhile and see what priorities we have for the next projects. And in the meantime, we’re busy making this house our home. Not that it isn’t already, thanks to the wonderful memories we’ve already started making here. Wonderful memories like sweating and swearing while covered in ceiling dust and popcorn mess while Hubs and I struggle to remove the popcorn ceilings on the 4th of July since it was the only day he wouldn’t have to take off work to get it done. And memories of yelling up and down the stairs about which lights and outlets were off so we could change all the switches and outlets from almond-colored to white. And scuffing our knuckles on the sand paper while getting ready to paint all the trim in the entire house…all three coats of it! And we’ve had a lot of good memories here just the two of us, like our first dinner here, our first night here, moving day, the day we got our living room all set up how we liked it, buying furniture, moving our things into the places we’ll keep them for as long as we stay here. Plus, we’ve had two different housewarming parties now . Talk about a blessing! 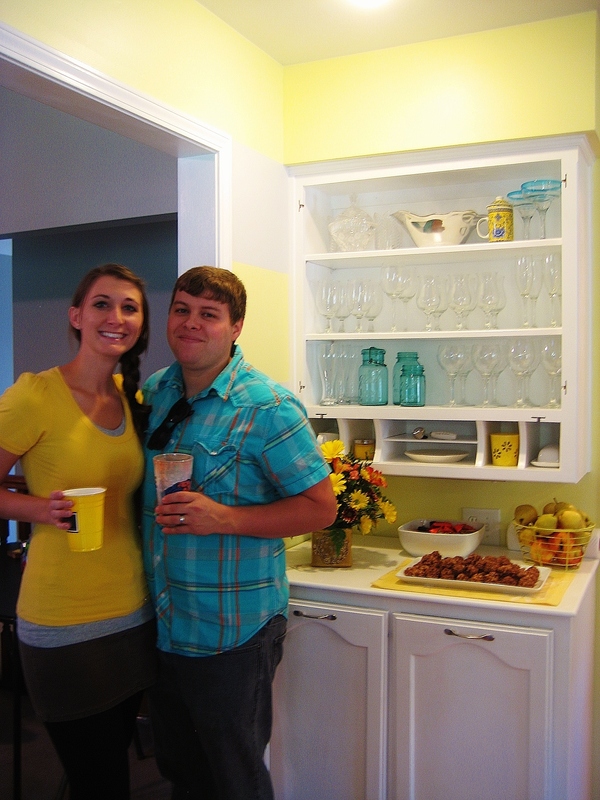 Yes, Hubs built the cabinet we’re standing in front on. Yes, we realize we are matching the colors in our kitchen. Yes, I know that’s cheesy, but no, I don’t care. It’s amazing the difference it makes to see and hear friends and family making themselves at home in your home. It’s amazing how much more like home it feels when it’s filled with so many people we love and care about. Well, because welcoming friends and family into my home is one of my favorite things to do. I love entertaining. I love cooking for people, with people. I love sharing good food around a big table. I love sitting in the living room just talking for hours or playing games. And yes, I love doing all those things with Hubs. Just the two of us. But there’s something about the hustle and bustle that comes with having a full house. It’s partly the reason I love to go stay with our families during the holidays even though it’s tempting to stay in and cozy up with Hubs, just the two of us in our quiet, happy home. It’s partly the reason I so love our loud, crazy game nights with friends that always involve yelling and arguing. I just love how happy a full house feels. Because when a house is full of people, the right people anyway, it’s full of love. That’s why I felt like I floating on cloud nine the night after our first house-warming party. And why I was so excited to have our friends come see out new home as soon as we could. And now that our house has officially been warmed, we’re finally settled into this happy home. Maybe for five years, maybe for ten. Maybe forever! What about you? What makes a house feel like home to you? Sorry it’s been so crazy long since I posted, you guys! I’m still here, I promise. And I’m living in a house that feels like a home and looks like a home. This past weekend was our housewarming parties with our families and now we’re getting ready for a party with our friends this weekend. There’s just too many of everyone to do them all in one day. Last week was crazy with cleaning everything up and finishing all of our projects at the last minute. We may or may not have been totally exhausted when it came time to actually have the party. Seriously though, we couldn’t have asked for a better day and it was so amazing to be able to celebrate our new home with our loved ones there with us. I loved bragging on Wyatt’s handiwork and showing people all the amazing stuff he’s built for me so far. I loved sharing our dreams for other future projects we’re excited to take on. But most of all, I loved seeing our yard full of kids running around with soccer balls and footballs and our cozy living room filled with people talking and laughing and eating. It was perfect in every way. Really. I was still after-glowing yesterday morning when I thought about how blessed we were by everyone that came. So now my focus is shifting to getting the new blog ready. Design and layout take a long time, as does coming up with content to fill the pages! I’m just now starting to dive into making it look and function like I want. My goal is to have everything ready and going by the holidays, but even sooner would be great! It sort of depends a little on how work goes for the next month or so…which is actually really busy right now! I love having writing assignments to fill my days and I’m so thankful for the opportunity to do this for a living. It’s what I love and I’m so blessed to be able to do something I really enjoy..even if it’s challenging to get settled into a routine for managing my time and my household chores and the way I want to do so many projects around the new house. Anyway, that’s what’s going on in our corner of the world. What’s new with you? This week has been a hard one for me, house-wise. I was feeling great heading into this week because we had a weekend with great progress last weekend, and I was hoping that would continue this week. Then, on Monday, we were so tired from our crazy weekend of work, we took a break. Tuesday was a shopping night. We needed to go to several stores to look for certain things we need for the house. It took a long time and was sort of frustrating as everything is just so darn expensive. Needless to say, we didn’t get much done when we got home. Wednesday was our busy day out together, and again, not a night with any time for any real progress. 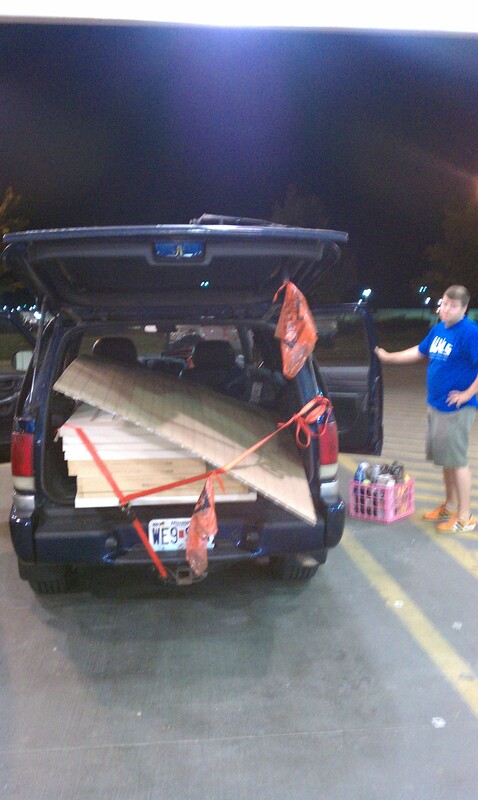 Thursday night was another shopping night, stocking up on supplies for our next projects and buying all our new doors. Yikes. Expensive and stressful. Again, no progress made, but a garage full of more work to do! Plus, when we were checking out at Home Depot, the girl rang everything up and then took our coupon, and informed us it wouldn’t work with the bulk discount we had gotten…so we asked her to ring the items up on two tickets so we could get both discounts. Which she did after rolling her eyes a little bit. But she didn’t get it quite right that time either and had to do it again. Oh joy, I love making a scene at public places. Luckily, no one was waiting on us. But I was happy we stuck with it and saved almost $50 off our total…even though it was a big pain. So yes, by the end of last night at Home Depot, I was tired and a little cranky. And I was not at all looking forward to loading my little SUV with all the stuff we had just spent all that money on. Plus, driving with my back hatch open makes me nervous, no matter how many straps Hubs uses to tie things in. Still, after a little bickering, a lot of apologizing, a little arranging, and a lot of rearranging, we managed to get this accomplished. Anyway, so we get all loaded up, buckled in, and with a bunch of random sports equipment and car stuff all over my lap since it won’t fit in the back and Wyatt goes to start the car. Neither of us has any idea why sitting there with the doors open for 10 minutes was enough to drain the battery, but it was I guess…so yea. Oh well. Wyatt says it must be time for a new one. I say…well, I pretty much agree with whatever he says on this topic. So, Hubs was a perfect gentlemen (even though I could tell he was really so angry and frustrated he wanted to scream or kick something) and asked one of the home depot worker guys if they could jump us. He said sure and went to get his cables. Only it turned out he didn’t have cables. So that guy asked another guy. Awesome. Let’s involve more people in this, I thought! But really, what other choice did we have? And we got a jump and got going on our merry little way home. Needless to say, I was pretty deflated by the time we got there. And it was already basically 10:00 so pretty much no progress got done last night either. But tonight will be better, because it’s a new day and because I’m sitting on our deck enjoying the beautiful weather and thinking how blessed we are to live here at all, no matter if we get all these projects done before our party or not. So, what about you? Anything new in your life? Ever needed a jump at a really, REALLY inconvenient time before? Well, guys, did you miss me? If you did, I was missing you, too! And if not, well, I wasn’t thinking of you at all either. So there! Anyway, the past 2 weeks were crazy busy for us newlyweds as we worked 12+ hour days at the fair and went crazy smelling steaks and onions at god-awful hours of the morning. I wrote more about that here. I also went a little crazy missing out new home. I spent the last 2 weeks at my parents’ house, sleeping on a (rather comfy and brand new) guest room bed. Hubs was there for most of those nights, but came back to our house to go to work for three days in the middle of it all. By the end of the two weeks, AKA yesterday afternoon, I was never so homesick in my life. I was counting down minutes and half minutes until we’d get there, ready to sleep in our own bed, see our half-painted walls, deal with the mess we left in our half-finished remodel project…and the mess Hubs made when he was here for three days without me in the middle of the week. And ready to get back to work! After we rest up and get better, as we are exhausted and both seem to have come down with some sort of summer cold. Ick. And we have internet at home! That means I can talk to you guys while sitting at home in my jammies instead of getting dressed and driving to Panera every time I want to check my email, write a blog post, or you, know, do some actual work. So, I’m just here to say, Hi! I’ve missed you. What’s new in your life? Now it’s your turn. Tell me what’s up! For some of you, the state fairs in your respective states come and go with no chance in your daily life. Not me. As the daughter of a beef cattle farmer, I’ve spent about 2 weeks every August working in a steakhouse at our state fair that’s run by the Missouri Cattlemen Association for almost as long as I can remember. We serve more than 1000 steaks a day, not including burgers, BBQ brisket, and all-beef hot dogs. It’s a frenzy of feeding hungry, tired and hot people for 12 hours a day in the heat of the summer. Luckily, we’re in an air-conditioned restaurant instead of one of those little stands that sell corn dogs and funnel cakes. Still, it’s a crazy time that I’ve come to enjoy in a unique sort of way, and after I got married and moved to Kansas City, I thought my days at the fair were pretty much over. Of course, last year at this time I was pretty much unemployed so I came to work to earn some extra money. And now I’m self-employed. So I “took some time off” to come stay at my parents’ house for the next couple of weeks. It’s a like a vacation. A vacation where I work 12 hours a day standing on concrete next to a giant grill. But the money will be a good addition to our savings account after it took such a hit with the down payment for our house. And it’s good to be home…away from home. Last night was the second night at my parents’ house without my husband, and while I miss him (miss him a lot! ), I have to admit how nice it is to spend time with my parents. Moving away, even though we’re only an hour and a half or so apart now at our new house, was hard for me, as I’ve always been a family girl. I went to a college about an hour away from home but came home most weekends because I wanted to see Wyatt and I was still involved with so much in my hometown. Seeing my parents was something I grew very used to, even after I “moved out,” per say, and I even took it for granted I think. Then I got married, (which is great!) and moved away, for real this time. Which was awesome and hard all at the same time. Harder than I thought it would be. And more amazing to live with my husband and best friend. Kansas City became our home. But then again, this house that I grew up in will always be home, too. It’s my home away from home, I guess you could say. In a happy shock after our engagement, how can I not love the house that holds so many special memories? I love that my mom stocks her shelves with all the foods I used to love when I was living here. It’s a treat to have all those loved snacks that Hubs and I don’t buy for ourselves on an everyday basis. Don’t get me wrong, I love our house in the city, er, the suburbs now, but I also love it here. And yes, I am counting down the hours until I’ll see Hubs again, but I’m also thankful for every minute here. There are no views like this in the city, that’s for sure. This place will always hold a special place in my heart. What about you? What do you love about coming home? How do you cope with being away from those you love? What are your favorite memories of the houses you grew up in. First of all, did you all see yesterday’s post? I’m trying to work on some new ideas for the blog and really want some input for you. Please take a minute to leave me a comment and give me some feedback on what sort of posts you like most and what is your favorite things about this blog. Next, I wanted to focus a little bit today on how I’ve been feeling about our marriage recently, as we transition into this second year of marriage. 1. I am so blessed by this husband of mine. He is wiser than I ever thought him to be, stronger than I’d seen him be, smarter, sweeter, and sexier than I could have ever imagined when I first fell head over heels in love with him at 16 years old. I know he’s going to continue to surprise me with his goodness as we transition from our family of two to having kids, grandkids, and more. 2. I’m surprised by how little we fight about anything serious. It seems the only things we bicker about are small, silly, and totally unimportant details. When we’re really faced with a scary circumstance, difficult life choice, or major struggle, we’re truly able to be helpmates for each other, and that makes up for all the little lovers’ spats that may take place on any given normal night. 3. I don’t feel the need to be with him all the time, but I certainly feel the desire. Don’t get me wrong, he sometimes enjoys going to play poker with some guys from work, and I enjoy having a girls’ night with my friends from back home, but overall, given the choice of socializing or relaxing with or without him, I’d choose to have him near me every time. And that’s not something I think will chance in the future, as I enjoy his company more now than ever before. And yes, I can function without him, but if I don’t have to, I won’t. But this is something I realize has nothing to do with us being newlyweds. 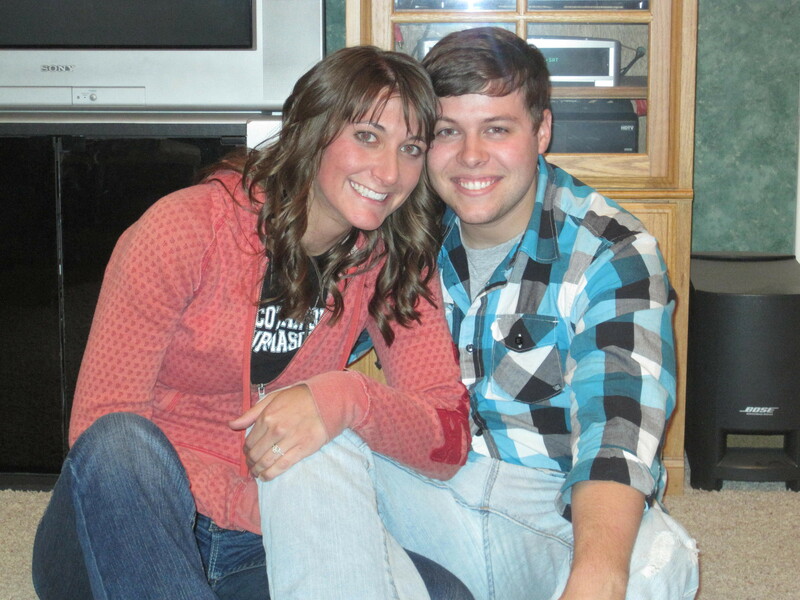 It’s about being in love, and being married to my very best friend. 4. Me not having a job where I work from 8 to 5 every day is a HUGE blessing. Yes, I’ve spent a huge amount of time belly-aching about not having a “real” job, but you know what? I’m growing used to the fact that this is my real job for this season of life. Sure, I don’t work full time doing this, but I enjoy the work and I get to do different things every day, and talk to a lot of people, and learn about lots of things I never knew about before. But mostly, I’m writing, which is what I think I’m meant to do. At least for now. And it’s given me so much time to help with stuff for the house. Someone needs to be there to let the carpet cleaning guy in and pay him after he’s finished? I can do it. Someone needs to go to the mechanic? That’s my job. The UPS store to return our equipment? Paint all the walls and trim in our house? Organize and clean everything? Yup, I can do all those things too. And how much of a blessing is it that either Hubs nor myself is having to take precious vacation time to be there for all this stuff? I’d say it’s huge. And for now, I’m content to write part- time and be a full-time wife to the man I love. 5. Sleeping together is still a challenge sometimes, but we’re totally settling into our preferred “sleeping positions” (as Hubs calls them), and snuggling positions, which I prefer we spend a few minutes in pre-sleeping time. Neither of us has suffered any major bruises because of bumps in the night, and I am learning to question with caution if I hear him saying something in the middle of the night, because he gets a little crabby when I ask questions after hearing his sleep-talking mumbles. 6. Holding hands is so important. Even just a few seconds walking into the store from the car are an opportunity to connect and share a sweet moment. I love that we both know to reach for the other at the perfect moment. It’s part of our routine now, something that hasn’t changed since we were first dating and that I know will continue into the future. What about you? What are you learning about your spouse in your marriage? I know it’s something, so share! Well, guys, we’re all moved. …as that would imply that we had everything unpacked, organized and put away. But that is not the case. Not the case at all. In fact, we are simply settling in to our new definition of crazy. Before, we were going crazy because we were living out of two homes, neither of which really felt like home because of all the boxes and messes and tools and paint cans and such. Now, we have one home that definitely feels like home, but it also looks like a giant mess. I want to focus today on some happier things, so I’m going to tell you some of the special things in life that move me. You know, the things that get me up in the morning and inspired to be my best. 1. Hubs. For one thing, the fact that he gets up every morning to go to work and provide for our little family is enough to inspire all sorts of love, respect, admiration and devotion. For another thing, he’s just so stinkin’ cute and smart and awesome that I get all giddy when I stop and think about how blessed I am to be married to my best friend. 2. Our new house. Yes, there’s so much more to do, and yes, I often feel overwhelmed and like I have no idea where to start to get it all done, but I’m just so darn happy we have this lovely place to live that all that really pales in comparison. I can’t wait to get it all fixed up so I can just relax and enjoy our home together. 3. Thoughts of being a “real” writer. I’m a freelance writer. So I work from home, usually on our couch. Today, because we are now at the new house with no internet, I’d working from a close-by Panera. And as of yet, I’ve been able to refrain from purchasing something from the pastry display that’s taunting me with every glance up from my screen. Still, having to come here today in order to get some work done is a blessing more than a curse because it means I have an assignment that I’m working on…and that’s a good thing. 4. Big dreams. Yea, I have them. I want our home to be lovely and neat and clean and ready to welcome friends and family as soon as possible. 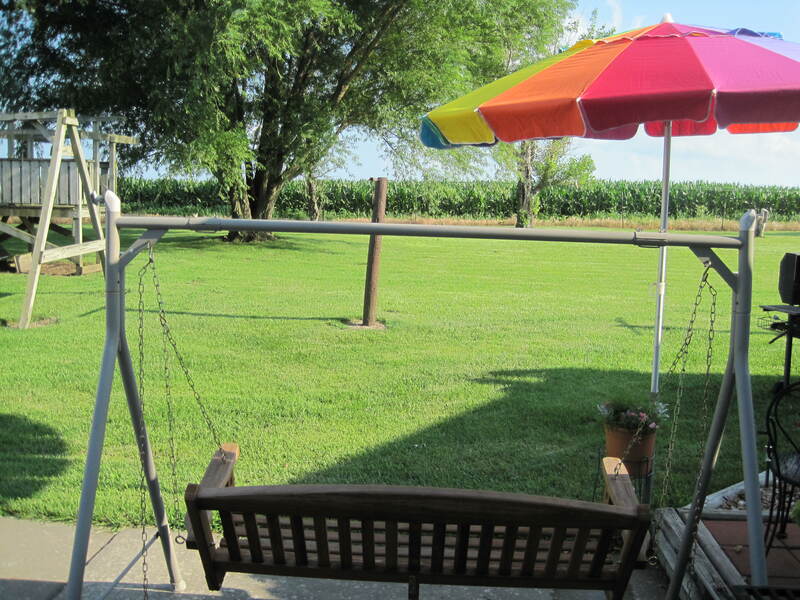 I also already imagine decorating nurseries, an office, a guest room, and watching our future kiddos play on the patio. I know those things are a long way off, but I enjoy dreaming about them just the same! 5. My ring. It’s sparkly and it makes me happy. Happy Melissa works harder and better than salty Melissa. 6. The Applebee’s Blondie that’s sitting in my fridge waiting for the perfect moment to be eaten in our new home. 7. The thought of never-before-ran-by-me sidewalks all around our new house. I see a high-mileage fall in my future. If this heat ever gives way to some cooler/safer temperatures. 8. A God who forgives me when I’m ungrateful for life’s blessings, too quick to judge, too slow to forgive, and too full of myself and my fears to rely on his timing and His plans for my life. Well, that’s enough inspiration for now. I’m off to get some actual work done, even though sitting here thinking about all that I’m thankful for in my life is much more fun…and having a reason to get up and get moving is always a good thing, even though moving in is proving to be a work in progress still. Your turn! Tell me what moves you, whether that means physically, mentally, emotionally, or spiritually! Let’s here it! Right now, the concept of home is a very complicated one. And we still think of Sedalia as the place we “go home to visit” when we stay with our families. Still, I think we’re happiest and most ourselves when we’re at home…our home…together. Because after all, that’s the real reason we ever feel at home…because we’re there together. As we’re house-hunting, I find myself imagining if I could picture us living in the house in question. Usually, it’s a no, and it gets frustrating to see house after house that just won’t work for us. But the reality is that even if we never find a house that I imagine can become our first house, I know that no matter where we end up, it will become a home…together. What about you? What makes your home feel most like home? Is it an object? A person? A special touch you add yourself? Any advice for buying our first house? Remember when Hubs and I resolved? And we resolved to buy a house this year? Well, I realized that we should probably start thinking about looking for a house sometime soon if we have any intention of buying in the semi-near future. After all, we don’t know anything about house-hunting. After I realized this, I set out thinking about the best way to move forward. I didn’t come up with any good plans, so I set out to creating a list of things I don’t know but feel like I should. 1. How much can we afford to pay each month on mortgage when we also include taxes and insurance? 2. How do we figure out how much insurance and taxes will be if we don’t know how much we can spend? 3 When is the best time to start looking? 4. Should we use a real estate agent? 5. If yes, how do we pick which one? 6. If no, how do we figure out stuff like reading a contract? 7. Where do we start to look when I don’t know where my job will be? 8. How long should we wait to start looking? …it could be years before I find a job I really want! Clearly, we have a lot to learn. P.S. I had an interview today. It went okay, but I don’t know anything yet. Also, I had to drive downtown by myself with very little idea of where or how I was going. But I made it. So, I’ll claim a little victory, at least, right? To celebrate, I think I’ll make pumpkin smoothies. Especially since we’re also celebrating our anniversary a day late since I got called into work last night.